Five years ago while researching the psychology of rock climbers in graduate school, I came across a term that finally identified a large part of my own experience in rock climbing: Flow. In my last post I mentioned giving name to the mental components of rock climbing. Well, this is a big component. You’ll hear me reference Flow – a lot. You could say I’m addicted to Flow. I even refer to it with a capital “F” because it commands that much respect as a climber. The term Flow was created by psychologist and father of Positive Psychology, Mihaly Csikszentmihalyi (pronounced “me-high cheek-sent-me-high-ee”). Flow has also been referred to as being “in the zone,” or “in the groove.” In Eastern philosophies, Flow is similar to the spiritual development of overcoming the duality of self and object. 1. Have clear goals (i.e. get to the top of the climb…). 2. The activity is set up to give you immediate feedback (i.e. popping off of a climb or successfully making it to the top is definitely immediate feedback). 3. There is a balance between the level of challenge and your level of skill (see chart below). 4. Have a high degree of concentration and focus. 6. You become so absorbed in what you are doing that you experience a loss of self-consciousness (as in worrying, am I doing this technique right? ), time flies by (wow, I can’t believe we’ve been on this route for an hour!) and your focus of awareness is narrowed to only the activity itself (you’re not thinking about bills you need to pay or the drama you had with your sig. other last night). Mihaly was one of the first researchers to include rock climbers in his psych research and recognized our skills as something more than “risk seeking.” He recognized the secret to what all climbers are really seeking: the experience of being “in Flow.” Whether we are conscious of it or not, we are all seeking the experience of Flow when we climb – and in our life in general. The problem with Flow is that the feeling is hard to obtain. I don’t get to feel Flow on every route that I climb. But I do seem to feel Flow more often than not and it keeps me hoping that I’ll feel it again. Finding Flow on a route is much like the psychology of gambling that keeps people going back for more. Gamblers win on a variable interval schedule called “intermittent reinforcement.” They win just often enough to get them to plug more money into the slot machine. I would be willing to bet (pun intended…) that gamblers are just like climbers in search of Flow. I have experienced Flow on an intermittent schedule and now that I’m aware of what the concept is in general, I find myself trying to consciously create Flow every time I climb. So why is experiencing Flow important while climbing? On the most basic level the experience of Flow is pure happiness. The research on the psychology of happiness has shown us that we could all use a little more of it to counter our daily stresses. Americans tend to be more unhappy than other cultures in spite of our vast resources and knowledge. On the climbing level, experiencing Flow will improve your climbing and improve your experience of your climbing. If you are constantly pushing yourself on projects (high challenge level), chances are that you may be spending more time in the Arousal and Anxiety fields of the chart. This can be frustrating and lower your motivation to continue. Or if your skills have improved but you’re not pushing yourself then you may be stuck in the Control section of the chart. Sometimes this can feel like our climbing growth has reached a plateau. Think about where you spend most of your time on this chart. What would you need to adjust in order to have a higher chance of experiencing Flow? Your thoughts about the Flow are totally new to me (although the creator of the term is Hungarian, just like me), however thinking of myself when doing such sport I can clearly recognize the feeling you described, it happened to me sometimes and feels great! With your list of the seven components needed to be present I will definetively focus more consciously of reaching this phase when climbing. Good luck for your blog, it is really interesting reading about this less published side of rock climbing as well. Thanks, Dana! I hope you'll keep coming back and find more that will contribute to your flow experiences. Nailed it!! I've been climbing for years, and people who don't climb want quantification of our experiences, and Csikszentmihalyi encapsulates my feelings quite well. What a wonderful piece! This is precisely why I got involved in both climbing and snowboarding, and coincidentally started practicing meditation about a year prior. All of these things started independently entering my life around the age of 20 and have kept me centered throughout my 20s. What a great job at articulating what most of us think, because what most people call "adventure seeking" is really just us trying to merge back into nature. 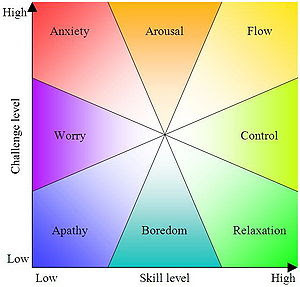 I also feel like projecting climbs I do experience a lot of anxiety and arousal, but I actually would say I'm very much in the flow state on those days. I probably think about less, but on a physical level I suppose there is more duality between me and the rock. You know, with it spitting me out every 10 minutes. It's the same with being engaged in a bouldering problem with a few friends for two hours-- I fall into a mode where if someone who didn't necessarily fit into the environment (like a HS teacher or cousin I haven't seen in years) walked up to me in the boulder field, it would take me a few moments to remember who they were in relation to me. Like, I just lose that part of the "self" when trying to unlock the boulder puzzle. Anywho, great article! Who wants to talk about psychology? !